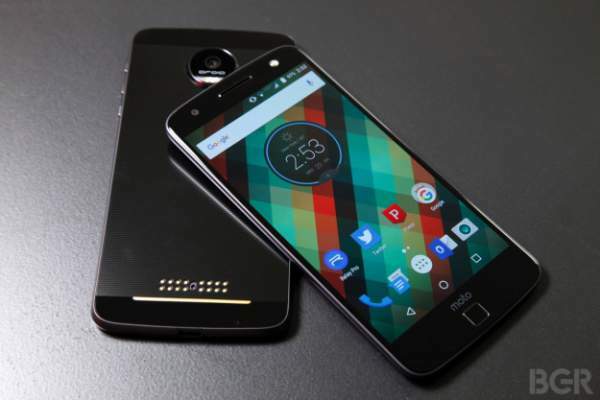 At that time also, a new smartphone in the Z series was rumored to launch in the same series.The device was expected to be known by the name MotoZ Play like the X series of the company. And the device is called so. It has been confirmed by a few shared couple of photos on Reddit and Instagram. After looking at the leaked images, we got to knew something new about the device. Z Play looks familiar to the earlier devices of the Z series. But the major difference is this gadget is equipped with a glass back panel, and it has the logo of the company ‘moto’ on the front side, near the proximity sensor in the device. We don’t have enough information about the specs of the device. Whatever we have, let us represent it to you. MotoZ Play features a 5.5 inches screen with 16M colors and with a resolution of 1080p. The screen resolution of the display is 1920 x 1080. It is also rumored that the Moto ZPlay is powered by a Qualcomm Snapdragon 625 chipset. The company is offering a RAM of 3 GB and an internal memory of 64 GB which can be expandable up to 128 GB using microSD card. The operating system of the product is Android Marshmallow v6.0.1. Over the camera, the rear camera has a 16 megapixels lens which provides functions like focus, phase detection, OIS, and dual LED flash. On the front, there is a 5 megapixels camera for selfies and video calling. The camera supports Geo-tagging, HDR, panorama and other common camera features also. The device is powered by a 3,500 mAh battery which will be nonremovable like the other devices in the series. There is also a Moto Mod connectors at the bottom of the back panel of the device. This shows that the smartphone will be compatible with modular design elements. This has been confirmed by the pics leaked on Reddit and Instagram. This makes you customize the device as you want. One thing might annoy you that the device has no fingerprint sensor which is the basic and common feature of the today’s smartphone. But it has other common sensors like compass, accelerometer and proximity sensor. It is expected that the company will launch the gadget at the upcoming IFA 2016. There is no information about the price if the smartphone, but it is expected that the device will be priced $300. For more information, ask your questions in the comment box and do subscribe to the website. Stay tuned.